The project in Wind River was to re-structure content and information architecture of a content management system based on Twiki. 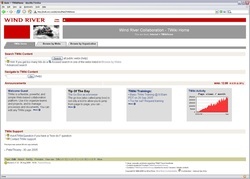 Wind River is a software engineering company that used Twiki as their content management system. 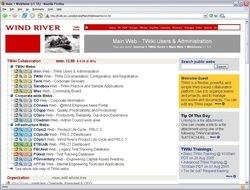 TWiki is a Perl-based structured wiki application, typically used to run a collaboration platform, content management system, a knowledge base, or a team portal. Content organization and information architecture in Twiki were such that users had difficulty in finding information they were looking for. This situation made it difficult to find, re-use, and update content. This also discouraged further adding of the new content and thus created areas where no documentation existed and the knowledge instead of being shared was being stored in personal computers. Storing the content in personal computers presented a risk of it being lost because it was not backed-up. There was a lot of obsolete content because no content owners have been formally identified and no retention schedule has been set up. Collaborative work on the documents and projects was accomplished by users sending links to Twiki pages. Without these links it was very difficult to find information. There was no information governance in place and so content management processes were very sporadic. The task was to re-organize the content organization and information architecture of the system and to set up information governance to solve these problems. I strongly believe in user-centered design, so I performed the users study. I identified stakeholders within each Wind River team and created the questionnaire for collecting users' requirements for the system re-organization and the usability issues. Based on these requirements, I re-organized the content structure and information architecture of the system. The major key to this re-organization was that the structure is very simple and intuitive. I made navigation very simple, created very intuitive labels, made sure that there is not too much information on one page and a user does not have to scroll down a very long page, that each page has a correct breadcrumb, and created taxonomy of webs (the building blocks of Twiki). Based on this taxonomy, I re-organized the location of documents. I also enhanced the system search. For each content type, document owners were identified and retention schedule was set up with the function to flag the content that would reach an expiration date according to the retention schedule. This flag function would send an email notification to the content administrator that a certain document reached an expiration date. This alert allowed the content administrator to contact the document owner for the decision on what should be done with this document: review and update, move to an archive, or delete. User acceptance testing of the system was performed. Users were satisfied with the system's new information architecture and indicated that it became much easier to find information. The system with new content structure and information architecture was deployed. Information governance was set up. Group and individual training was conducted on ongoing basis. The project was a success. Company management and users were very cooperative in helping to make this project a success. It helped to increase efficiency and productivity and thus saved Wind River cost because employees did not waste any time on searching for documents or recreating documents that already exist. 1. User-centered design is paramount to the project success. When you design and build the system based on users’ requirements, they are going to use it. Users have the sense of ownership of the system which provides excellent starting point. They know that the system you are building will be what they need. 2. Top-down support is critical for the project success. Management support is a huge factor in employees' encouragement to use the system and in setting up and enforcing procedures for information governance. 3. Assurance of users from the very beginning that they will not be left alone with the system provided their cooperation. 4. User acceptance testing helped to encourage employees to start using the system. When they participate in this process, this gives them the feeling of ownership of the system. 5. Ongoing training after the system deployment with the new content structure and information architecture made user adoption smooth.